And, although a revised Galileo Open Service Signal-in-Space Interface Control Document (OS-SIS-ICD) will appear soon allowing manufacture and sale of Galileo equipment without a license, the ICD will still require a license for commercial use of the intellectual property contained in the document. 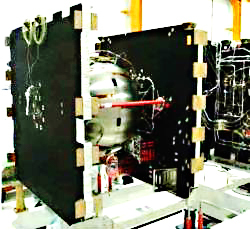 The first two in-orbit validation (IOV) satellites are still scheduled for launch in November 2010 from the European Space Agency (ESA) facility in Korou, and the next two in April 2011. They will be placed in orbit by a European version of Russia’s Soyuz rocket. However, program managers have down-sized their expectations and now anticipate that Galileo will field an initial constellation of only 16 satellites (out of a planned 30) by the end of 2013: 4 IOV and 12 FOC satellites. The European Commission (EC) has divided the purchase of 28 additional satellites (including two spares) planned for the fully operational capability (FOC) constellation into two work orders. The first work order will buy up to 22 satellites and the second work order, the rest. The two remain bidders — competing teams of OHB System/Surrey Satellite Technology Ltd. and EADS Astrium/Thales Alenia Space — have until November 13 to submit their best and final offers for 8, 14, and 22 satellites. The options included in the EC request provide leeway for choosing both vendors to supply satellites — a prospect supported by OHB but opposed by Astrium, the presumed favorite candidate under a winner-take-all scenario. The decision on whether to have a single- or double-source selection for the satellites is still under consideration and will be resolved by the end of this year. The schedule for full deployment of the system will become clear by the end of this year, but completion of the program will depend on the resources available to the program in the next funding cycle that begins in 2014, including the 8th Framework Program (FP8) overseen by the EC. Negotiations will almost certainly take place well ahead of time, so that the program will not need to wait until 2014 to have the necessary confirmations of funding. The Commission had budgeted €840 million euros ($1.24 billion) for the contract to build the Galileo satellites when it wanted 28 to 30 satellites and that the bids received so far appear in line with that estimate. However, a €350-million-plus cost overrun in the IOV contract was not included in the overall €3.4-billion Galileo allocation, causing the program to return to the budgetary well. Galileo services will be rolled out gradually, with the open service, encrypted public regulated service (PRS) and search and rescue (SAR) signals available in 2013 and the safety-of-life and commercial signals sometime later. A revision to the OS-SIS-ICD is under way and should be published within a few weeks, according to EC representatives. Carlo Des Dorides has lead responsibility for drafting the document. Under the revision, a licensing document will no longer be required in order to manufacture and sell Galileo receiver equipment and signal simulators, according to the EC. However, a license will still be needed for using the intellectual property rights (IPR) contained in the OS-SIS-ICD for commercial purposes. The license agreement document will be downloadable on the Commission’s website. As for the European Geostationary Navigation Overlay Service (EGNOS, a space-based augmentation system), Europe is on track to provide additional services next year. When the EC declares the readiness of EGNOS’ safety-of-life service, users will be able to receive an integrity message warning of any malfunction of the GPS signal within six seconds. The EC also expects to launch the EGNOS Commercial Service next year, which is currently being tested by a number of European companies.